After leaving Uncas’ monument, drive (or walk) to the end of Sachem Street, and turn left onto Lafayette Street. Go one block, and take a left onto Yantic Street. Park on the street, head toward the railroad bridge, and follow the signs and sounds to the falls. With the dawn of the 17th Century, came an upheaval in the established world-order of the Native American tribes that was both overwhelming and unstoppable. Although the tribes had been traditional, competing rivals in territory, economics, and trade, the foundational structure of the Native people had been well-established for centuries, if not millennia. The glue that bound the various tribes of the Northeast (and elsewhere) came from their being inter-related through marriages and political alliances, which developed into other alliances. This created a stability, despite periodic conflicts. 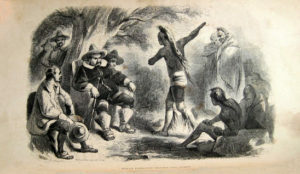 With the arrival of a seemingly endless wave of European (Dutch, French, and English) immigrants, all of that changed drastically and dramatically, affecting every aspect of Native American life: politically; economically; culturally; medically; religiously; militarily; judicially – across the board, taking the Native Americans by surprise. These changes, coupled with a massive reduction in population, due to a lack of immunity to new European diseases like smallpox and measles, made the tribes vulnerable. 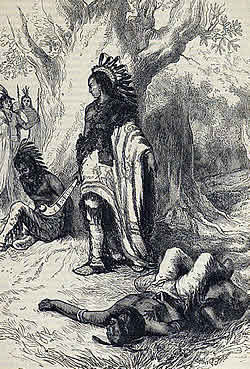 Conflicts between the European cultures spilled-over into the Native American tribes, and as lines were drawn, crossed, and re-drawn, the far-reaching negative ramifications fell upon the Native Americans. Treaties were made and broken, and one man’s word did not mean that another man (or even the same man, under different circumstances, and at a different moment in time) would not abrogate that treaty, making it practically, if not completely worthless. Moreover, Native women were often the parties responsible for signing-off on Native land, and this custom was frequently ignored, along with their authority. Uncas, Sachem of the Mohegan Tribe, chose the path of cooperation and peaceful co-existence with the English colonists, and their relationship became one of reciprocal support and defense against the two other major tribes in the area: the Pequots and Narragansetts. In the 1637 Pequot War, Uncas’ Mohegans, and some Narragansetts, allied with the English, attacked the Pequots. 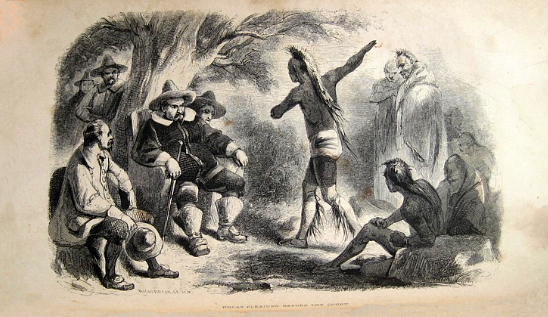 Colonial Captain John Mason ordered the burning of the Pequots’ fortified villages, which became known as the Massacre at Mystic. This sort of brutality was unknown to the Natives, for whom battles were more like skirmishes. 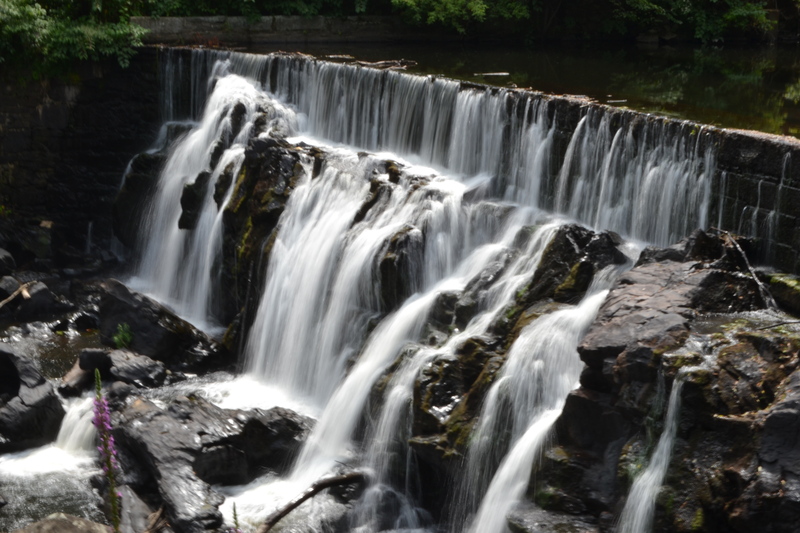 My song “Uncas Leap” begins at that point in history – 1643, when Uncas, “The Fox” outwitted the invading Narragansett Chief Miantonomo, who had arrived with hundreds of warriors to attack the Mohegans. 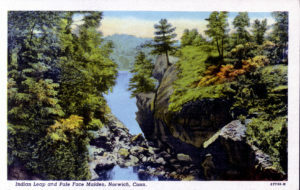 After Uncas turned the tables through trickery, many of the fleeing Narragansetts, who were unable to leap the gorge at Yantic Falls, fell to their deaths on the rocks below. What was not mentioned in the song was the cultural tradition among Native Americans that mandated that a capture and surrender be made by someone of equal rank and stature (i.e. Sachem-to-Sachem). After Uncas and the Mohegans successfully sent the Narragansetts fleeing, he (i.e. Uncas) sent his fastest runner, Tantaquidgeon after Miantonomo, to stop and hold him until Uncas arrived to make the official capture. 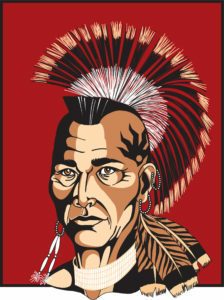 To this day, the descendants of Tantaquidgeon proudly wear the hand of capture symbol on their tribal regalia.